There are a lot of wallet cases for iPhones, but none has the ease of use and slim lines of Distil Union's Wally Case and Wally Stick-On. 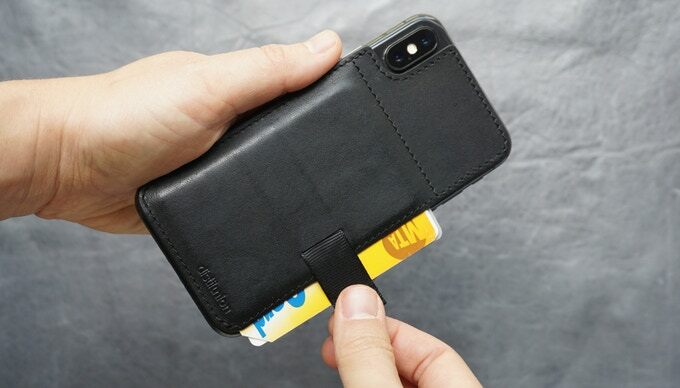 These two cases make it simple to carry the important cards -- ID and a couple of credit cards -- with you without the need for a full wallet, and they've been a favorite of iPhone users for five years now. Charleston, SC design house Distil Union recently started a Kickstarter crowdfunding campaign to bring the Wally cases to iPhone X, and it's currently at 75% funding with about a month to go. Distil Union's Lindsay Windham and Nate Justiss have been perfecting the Wally cases for a half-decade now, and the pre-production version of the iPhone X case I received for testing is proof of that dedication. The Wally Case is an all-leather design that protects the sides and top of the iPhone X and has the trademark clever slot for carrying cards, while the Wally Stick-On sticks onto the back of the iPhone X. The Wally Case and Wally Stick-On come with an edge to edge 9H glass shield to protect the front of your iPhone X from accidental drops, and yes, both cases do work with those Qi wireless chargers! My favorite feature of the Wally Case and Wally Stick-On since day one has been the design of the card slot, which has a ingenious pull-tab that makes removing the cards a snap. The Wally Stick-On. Photo courtesy of Distil Union. The Wally cases are available in black, brown, gray and red, and the full-grain leather they're crafted from has a great feel in the hand, adding a bit of warmth and softness to the otherwise hard surfaces of the iPhone X. They're also very thin, adding that luxurious feel without sacrificing the thin lines of the iPhone X. Finally, the backer pricing on the cases is incredible for such a classy product -- Distil Union is asking $24 for the Wally Stick-On and $34 for the Wally Case. That's with the tempered glass screen protector included, making this one of the best deals you'll find on a leather case for your iPhone X. Retail prices will go up to $40 and $50 respectively for the Stick-On and Case. You have until June 22nd to support Distil Union's Kickstarter, and you can expect to receive your Wally Case or Wally Stick-On shortly thereafter.